As an agency, we run Google Ads in tandem with SEO efforts for almost 100% of our clients. I have hit on the fact in previous articles that a solid Google ad campaign can help SEO efforts, so if you are attempting an SEO campaign for your business it is generally always a good idea to have a Google ads campaign running in tandem with those efforts. This being known, the question I get the most concerning Google Ads is surrounding what to budget with Google Ads campaigns? The answer to this question is not much different than many of the answers we give. It depends on what you are trying to accomplish. The vast majority of our agency clients are looking for new business leads, so I will use that scenario for this article, but bear in mind that there are many different scenarios where the approach may be a bit different. Any Google Ads agency worth its weight should be able to get you an estimate of what you should expect to pay for a click on search ads. 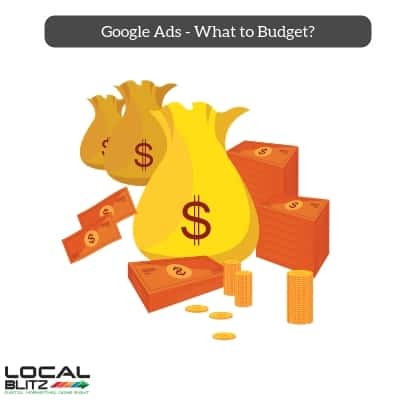 This cost per click varies widely from industry to industry and should be your first indicator of what you might budget. For instance, we have clients who have a CPC of around $1.00 and a budget of $500-1000 per month could go a long way for them. On the other hand, there are clients that are paying $150+ per click and that same budget would barely cover a hand full of clicks to website if the budget was only $500/mth. All this being said, as a general rule I would tell clients that a budget of your estimated CPC x 100, is probably the best place to start or $500 whichever is greater. While you could work within a smaller budget, for those that are not sure where to start, I believe this is a good rule to ensure they are getting at least close to 100 clicks to the website from paid traffic sources per month. The next thing to consider is conversion. Not all traffic is created equal and optimizing an Adwords search campaign or display campaign will be an ongoing task. Part of this is making sure that you are bidding on search terms that are converting into leads. While there is more to conversion than just that, a honed in campaign should have a good pulse on what keywords are converting for you and which ones are not. This is why proper keyword research is so essential to a successful campaign. All this to say, when deciding what to budget keeping conversion rates in mind is key to understanding how far your budget will take you. Using the example from before of 100 clicks per month, understand that a good conversion rate would be 5%. This means that of the 100 that hit your website or landing page that only 5 will take the action that you want them to take. So if $500/mth gets you 100 clicks and 5 of those clicks turn into leads your cost per lead is $100. This is the type of information that I try and walk clients through to decide what they may want to budget. If you want 20 leads a month in this example you may need to budget around $2000/mth to accomplish that goal. While this is just an example based on nice round numbers, this is the logic that must be used when thinking about what to budget for a Google Ads campaign. When picking budget numbers, one must use realistic historical data to decide how far every dollar spent might go. Some of the key concepts are cost per lead, cost of new client acquisition, and optimizing cost per click with higher quality scores. Long story short, I believe it to be a best practice to take the average CPC and multiply by 100 as a starting place for those that are not certain what to budget.